Now... let's continue with the previous article and let's have a look at some health issues related to work with the computer. 2. There are many health problems which have not yet been clearly identified by the doctors ( and it may take a long while before they actually will be ) - and which are the consequence of working on the computer. But in reality it is not so important to know about all the consequences coming from it and rather it would be much more important to identify the cause because once we know the source and apply the correction then we will have the chance to prevent most of the problems and then there will be no need to identify what is what. So... the simplicity is the key. 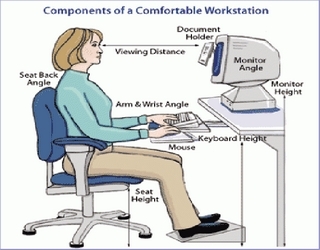 Now... there has been already a lot of studies and research done in regards to the ergonomic and effective position while working with the computer and thus I do not see the need to duplicate the information here. Do some search on internet, read about it and apply it in your work. It will make the difference in regards to your health and in your effectiveness at work. When it comes to shallow breathing I did not see much information out there. But have a look at yourself how you breathe while you work with the computer. I am certain that your breath is very shallow and you are not aware of it ( maybe now you will pay more attention to it ). Breathing is one of the most important things for the proper functioning of your body. And here we spend some 8 hours or more a day with very bad breathing. This one thing creates enormous negative consequences for the body. Without proper supply of oxygen the body becomes acidic and this facilitates development of all sorts of diseases within the body. Most of the doctors will not tell you about it but in the end this is undeniable fact.